INTELLIGENT LIVES stars three pioneering young American adults with intellectual disabilities – Micah, Naieer, and Naomie – who challenge perceptions of intelligence as they navigate high school, college, and the workforce. Academy Award-winning actor and narrator, Chris Cooper, contextualizes the lives of these central characters through the emotional story of his son Jesse, as the film unpacks the shameful and ongoing track record of intelligence testing in the U.S. This screening is free and open to the public but space is limited so get registered today! Collectively, Iowans with disabilities could make up one of the state’s largest blocs of influence; however, research shows that a lack of confidence, apathy and other barriers prevent thousands from engaging in advocacy. Check out what we were up to in 2018! 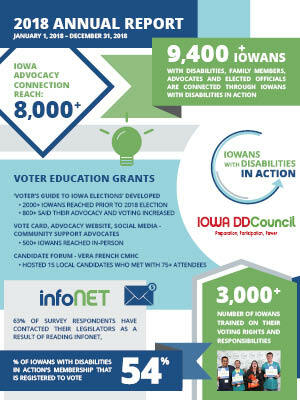 Join the Iowans with Disabilities in Action network of more than 9,000 Iowans who want to get more involved civically and politically in the state (it's FREE). You will have access to the latest information and resources to help you take action in your community and state. You will be subscribed to the Iowa Advocacy Connection and infoNET e-publication to keep you informed and updated on what’s happening with Iowans with Disabilities in Action, the Iowa Legislature and opportunities to get involved. Your donation will help more Iowans with disabilities become educated and empowered to advocate for change. Iowans with Disabilities in Action is a project of the Iowa Developmental Disabilities Council. The DD Council is a federally funded state agency that advocates for the development of services and supports so that Iowans with developmental disabilities can make choices and take control of their lives. Visit the DD Council website to learn more. Don't forget to check out our advocacy forum (infoNET) for information, tools, resources and opportunities you need to take action on the issues important to you.